Before we start talking about the insanity of what almost amounts to deep-fried guacamole, let’s talk about safety. Because there are some things you shouldn’t do on a school night. Like drinking most of a bottle of wine all by yourself. And then come the things that you shouldn’t do after drinking most of a bottle of wine yourself on a school night. Like getting anywhere near an open flame and hot, splattering oil. But there is one thing that you should totally do with hot, splattering oil when you have all of your fine motor skills about you so you probably won’t burn yourself 4 times in 10 minutes (how am I even still alive? 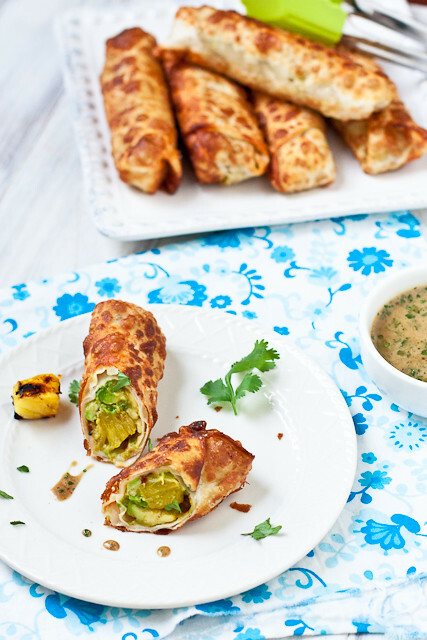 ): Make these Grilled Pineapple & Avocado Eggrolls. Several years back, I made a clone of the Cheesecake Factory Eggroll recipe. It was… work. There was cream cheese and sundried tomatoes in the filling with the avocado and I’ve always found that kind of an odd combo. Although I will totally dominate a plate without complaint and call it dinner once a year. And then the sauce had a couple new-to-me ingredients that were pricey and ended up going to waste because what else was I supposed to do with the rest of a $12 jar of tamarind paste? You know, besides not buy it in the first place. But the one thing that recipe did get right? 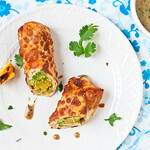 Wrapping chunky avocado in a thin, crispy fried shell. It’s basically fried guacamole. And it’s not at all hard to accomplish. I basically made an extra chunky version of my very favorite guacamole, which is loaded with sweet and smokey cubes of grilled pineapple, wrapped that up in an eggroll wrapper, and fried for ~1 minute on each side. The dipping sauce was a crudely-measured, raid-the-pantry combination of soy sauce, honey, garlic, red pepper, and cilantro. Sweet, salty, savory, and slightly spicy all in a single bite. And my poor burned fingertips (WHY DIDN’T I USE TONGS) have nearly completely healed. 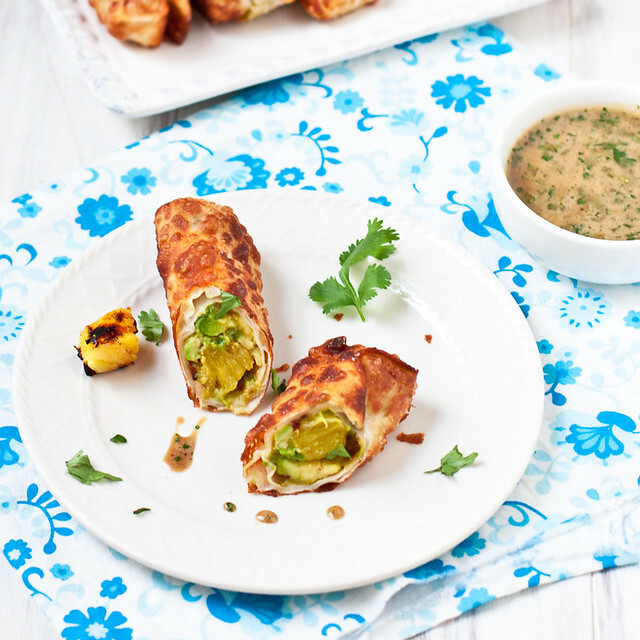 Avocado and juicy grilled pineapple are served inside crispy eggrolls. *If you aren't working with leftover pineapple, remove the husk, slice into ~1/2-inch thick rings, and place on a preheated grill. Cook ~4-5 minutes each side until nicely caramelized. Pour cooking oil into a pan and heat over medium high. In a large bowl, toss the avocado, pineapple. salt, lime juice, red onion, and pepper together. Lay a single wrapper on your work surface, dip your fingers in the water, and lightly moisten all four the edges of the wrapper. Place ~3 Tbsp of filling onto your eggroll wrapper and roll (I didn't get photos buy you can see the step by step here. Working with 3-4 eggrolls at a time, place them in the heated oil (it should sizzle with a drop of water) and fry ~1 minutes each side, until golden brown. Remove to a paper-towel lined plate and serve hot. To make the dipping sauce, whisk all ingredients together. These eggrolls are so unique!! Love the recipe! Oh yummy! These rolls look and sound so delicious! Yes! To seal the wrappers. I find that i can’t be trusted around hot oil when I’m totally sober, let alone after drinking!! Kudos to you for surviving to tell the tale of your oil woes. 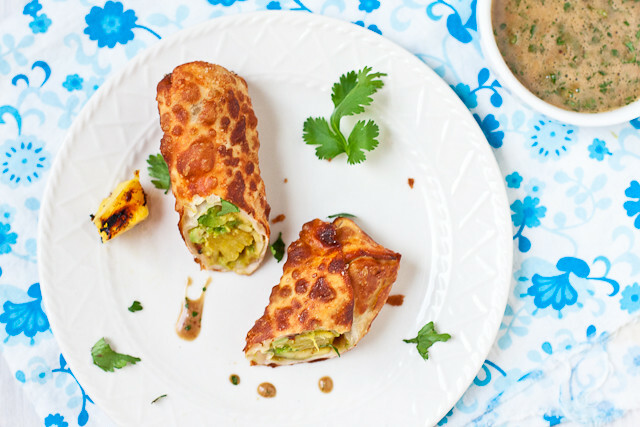 So into these guac egg rolls! What a fun way to eat it! I love this idea, it looks great!